In February this year, 68-year-old Allen Zderad saw his own reflection on a window for the first time in a decade. He could also make out human forms and outlines of objects. Eventually, without using his cane, Zderad will be able to make his way through a busy shopping mall or a room full of people. Suffering from a rare genetic eye disease called retinitis pigmentosa, where photoreceptor cells in the retina of the eye degenerate with time, Zderad had to give up his career as a chemist 20 years ago. His grandson, too, suffers from the same condition. Retinitis pigmentosa has no effective treatment or cure and Zderad eventually went blind; he was unable to see anything except bright patches of light. In January, Zderad agreed to a clinical trial which tested a visual prosthetic device known as the bionic eye. Bypassing the damaged retina, the implant sends light wave signals to the optic nerves. First, a tiny chip was inserted in his right eye, and wires were attached. Some days later the rest of the bionic eye, a miniature camera fitted into glasses, was activated. Zderad could see his wife once again—not in great detail but just her outline. Still, he lunged out to grab her hands and both broke into tears. “It’s a medical story, a science and technology advancement and a romance wrapped into one moment," said a statement from the Mayo Clinic in Minnesota, US, where Zderad was treated. Currently the bionic eye can only help those whose optic nerves are at least partially functional—otherwise data captured by the camera cannot be processed by the brain. This means the device cannot help restore vision in those who are born blind. But medical practitioners are hopeful. “I would like to see this technology extended to patients who have lost their eyes," said Raymond Iezzi, ophthalmologist and eye surgeon at the Mayo Clinic, who treated Zderad. “We have soldiers who have had terrible trauma and have lost their sight. We have diabetic patients who have lost both eyes… or patients with advanced glaucoma." In future, the technology could be extended to bypass the eyes altogether and go directly to the brain, said Iezzi. “I think we’re going to see that happen in our lifetime. In addition, while Zderad has 60 points of stimulation, if we are able to increase that number to several hundred points of stimulation, I think we will be able to extend the technology so that patients can recognize faces and perhaps even read." In another first this year, 80-year-old Ray Flynn from Manchester, UK, was fitted with a bionic eye in July. Flynn suffered from age-related macular degeneration that affects at least 20 million people globally. “It’s definitely improved my vision, but I haven’t been out and about on a bus yet," Flynn told The Guardian after the implant. 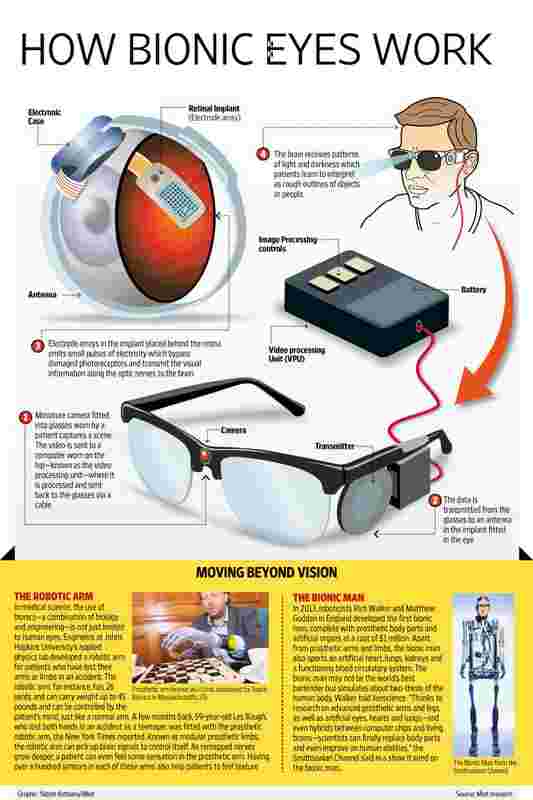 Both Zderad and Flynn were fitted with the bionic eye known as Argus II, developed by Second Sight, a California-based company that manufactures implantable visual prosthetics.